I have been busy as all get out and am sorry for not updating the blog. Between caring for my family, getting a promotion at my 9-5, and squeezing in more research, it just hasn't been easy to post. Not to mention, having to figure out what should be posted from the research has pushed me away from posting. Just a reminder that my various methods have hit the two tropical systems well in advance. Tropical Storm Gordon was hinted at on August 3rd and 17th, respectfully, for the first part of September. August 9th, the BSR did have a tropical system moving in from the Gulf on the 30th. 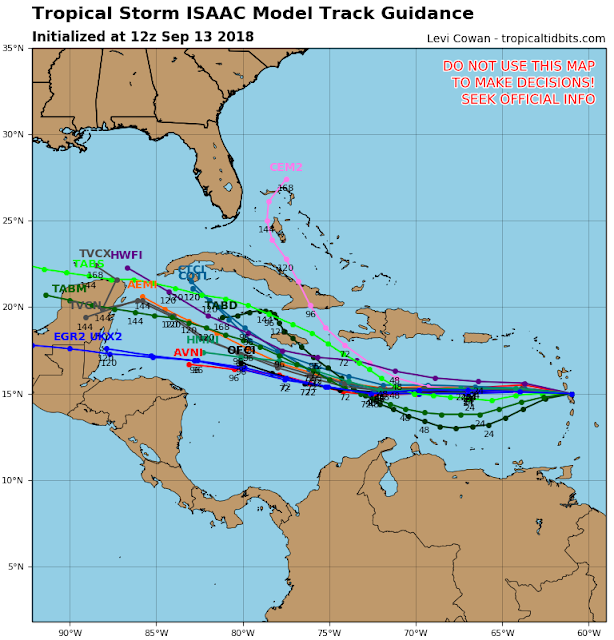 On August 18th, the EAR started to hint at a pattern of a tropical system moving from the Caribbean into the Florida Straits before hitting the Gulf Coast on the 30th also. Now...taking the information above, with the analogs attached, I would have voiced that my concern was for a tropical system hitting the central gulf in late August or early September. Now I will bring your attention to Hurricane Florence. The same analog forecast which foretold Gordon, saw this for a possible SE hit on the 17th and 24th. Much like earlier, the BSR had a tropical system stall out on the 6th...right off of North Carolina. While the EAR had it slingshot from Florida straight up the MidAtl a few days later after the 11th. Due to the "delay" experienced with Gordon, my warning would've been for late the 2nd week of September. Finally...was this a hint of Isaac? The BSR had a system moving North from the Gulf around the 20th! I will be bringing up the faster depictions of the BSR/EAR to Dr. Lupo and see what we can come up with.